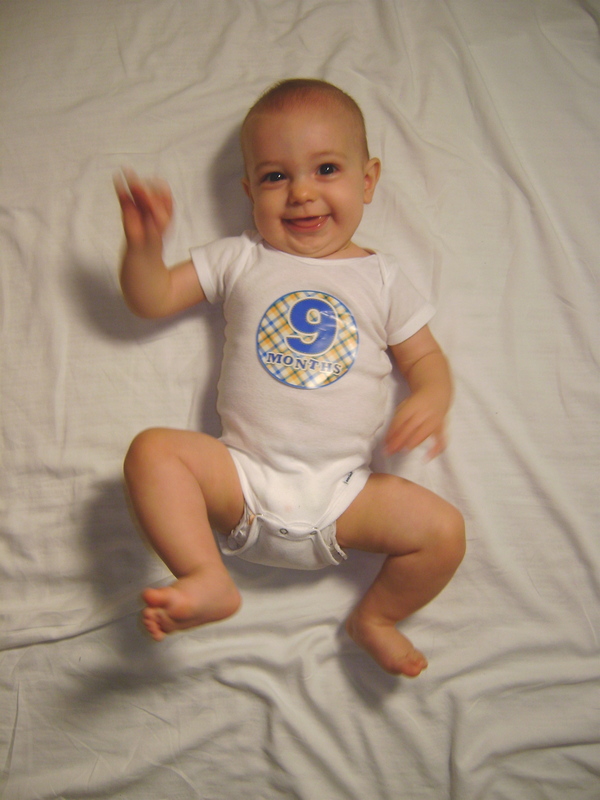 Henry, At nine months you…. Didn’t gain much weight this month but you did get longer (18 lb 4 oz (25%), 29″ length (76%) and 18″ head circumference (71%)). 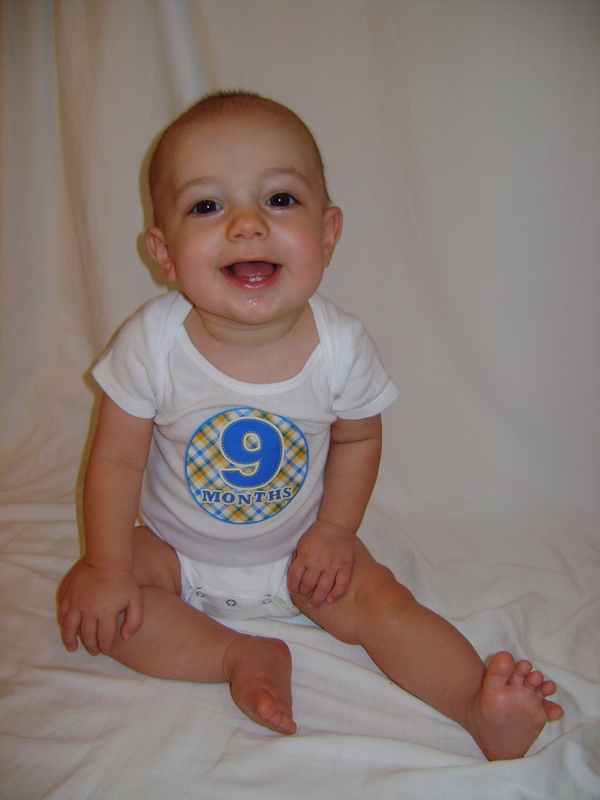 You are wearing 6-9 month clothes but I don’t think that will last long. Are finally eating at normal breakfast, lunch and dinner times. In addition to those three feedings you also nurse one more time before bed. That fourth feeding could probably be dropped but I try to get as much milk in you as I can. Are taking two naps a day. One long hour and a half nap in the morning and a shorter 30 minute nap in the afternoon. Like to army crawl and I don’t think you will ever do the traditional hands and knees crawl. 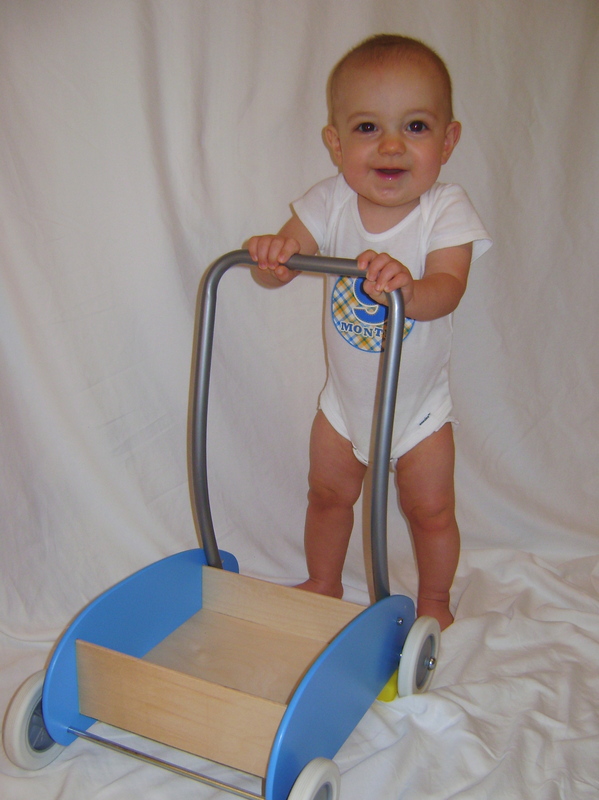 Love to walk in your walker, behind anything you can push along the floor and when we hold your hands. Sometimes we put you in your Johnny Jump Up and you get so frustrated because you can’t walk more than two feet in it, I don’t think you have ever bounced up and down in that thing. Haven’t really figured out how to move side to side so you have only crused along furniture once. Can pull yourself up from your tummy to a standing position. Like to climb up on top of objects that are low to the ground. Have learned some of the words that I frequently say and sign. When I ask if you want “more” food you will smile and look over at the food. If you are fussy during a diaper change and I say that we are “all done” you will stop fussing. Added Da-da to your vocabulary. Are doing better at repeating actions. If I push the button, you push the button. Will grab an object that you don’t want and fling it away or you will push my hand that is holding the object away. Will notice if there is some food on your face near your mouth and will push it into your mouth with your fingers. Love to leave the house. It doesn’t matter where we are going, you’re just happy to be out and about. Are a happy baby who smiles at everyone.